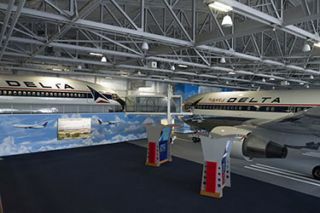 When the Delta Flight Museum decided to renovate its nearly 20-year old facility, they knew that, while the museum celebrated the history of flight in general and the greatness of Delta Airlines in particular, they needed a very forward-looking way to engage their visitors from the minute they entered the new 68,000 square-foot space. Luckily for them, NanoLumens, the world's leading designer and manufacturer of indoor LED displays, had exactly what they were looking for - a state-of-the-art 181" diagonal 5mm pixel pitch NanoSlim display custom designed for the museum's entrance. A 181" diagonal 5mm pixel pitch NanoSlim display will greet visitors as soon as they enter the newly renovated Delta Flight Museum this summer. "While renovating the museum, the client wanted to incorporate the latest display technology to engage their visitors and galvanize their attention," NanoLumens director of business development Nate Remmes said. "The newly expanded and enhanced museum plans to post a great deal of information on the display that greets their visitors, so they wanted to make sure that visitors will stop and absorb this information before proceeding with their visit. The NanoSlim display is so visually stunning it will do that better than any other solution out there." The newly expanded and enhanced Delta Flight Museum in Atlanta, GA, reopened to the public last week. Visitors are able to explore aviation history, celebrate the story and people of Delta, and discover the future of flight. The idea for the Delta Flight Museum took off in 1990 when airline retirees launched an effort to locate one of Delta's first 1940's Douglas DC-3 aircraft. This search, with the consolidation of the Delta Archives, created a groundswell of support that expanded into a museum. Delta Air Transport Heritage Museum, today known as Delta Flight Museum, was incorporated on May 23, 1995. Today, the Delta Flight Museum is an independent nonprofit corporation organized exclusively for public charitable uses and purposes and a qualified 501(c)(3) organization. The Museum is located on the campus of Delta's World Headquarters, in Historic Hangars One and Two. NanoLumens displays are extremely slim, ultra-lightweight, energy efficient, and feature a bright, seamless, high resolution picture quality that can be viewed from any angle throughout the display horizon without color shift or image distortion. The company's patented display technology promises to transform the way marketers engage their customers in every type of trade show, retail, hospitality, stadium, arena,transportation and public event environment. In addition, NanoLumens' LED displays utilize eco-friendly technology. A NanoSlim display only needs the wattage used to run a standard hairdryer. All displays are also made from 50% recycled material and are 100% recyclable themselves. All NanoLumens displays accept input from nearly any device or content management system. There is no need for special software, hardware or special personnel to display content beautifully.